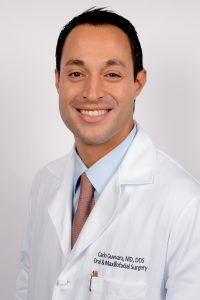 Dr. Guevara’s main areas of interest include (1) the surgical management of skeletal facial deformities involving orthognathic surgery, distraction osteogenesis, and bone reconstruction (2) Pediatric craniofacial abnormalities including cleft lip and palate, (3) the management of complex facial trauma (children and adults) (4) Airway Surgery, and (5) General oral and maxillofacial surgery (pediatric and adult). Guevara C, Wallender A, Steinberg B, Ranalli, N. Primary delayed onset craniosynostosis in a child demonstrated by serial computed tomography imaging: case report. J. Oral Maxillofac. Surg. June 2016; 45. 11: 1347-1350. Guevara C, Pirgousis P, Steinberg B. Maxillofacial Gunshot Injuries: A Comparison of Civilian and Military Data. J Oral Maxillofac Surg. April 2016; 74. 4. The surgical management of craniosynostosis: Open calvarial vault reconstruction vs Endoscopically-assisted treatment. 2017 Annual Conference of the Israeli Association of Oral and Maxillofacial Surgeons on Technologies and Updates in Oral and Maxillofacial Surgery. Tel Aviv, Israel. Sagittal craniosynostosis with overlying calcified cephalohematoma in a newborn. American Academy of Craniomaxillofacial Surgeons. Pittsburg, PA.
Quantitative analysis of facial soft tissue perfusion during hypotensive anesthesia using SPY laser-assisted fluorescence angiography technology. University of Florida College of Medicine Research Day. Jacksonville, FL.